A Collection of Lamp Makeovers from the Farmhouse Hens - Of Faeries & Fauna Craft Co. 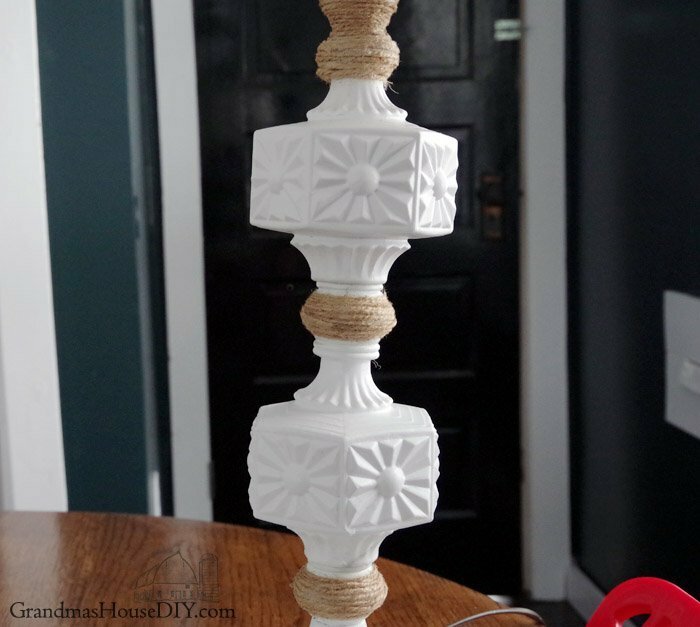 This month the Farmhouse Hens are collaborating on DIY lamp ideas and makeover. The topic of lamps was actually my suggestion, and I was regretting it until I found an inexpensive lamp. I found this lamp in the tiny thrift store I make all my donations at. I rarely see lamps at this store and was really excited to find this one. I knew right away what I wanted to do with. The lamp is so tall and modern looking, and I love the long lean look of it. This makeover is simple to do to, nothing really elaborate here, but I cannot wait to get to glam her up. 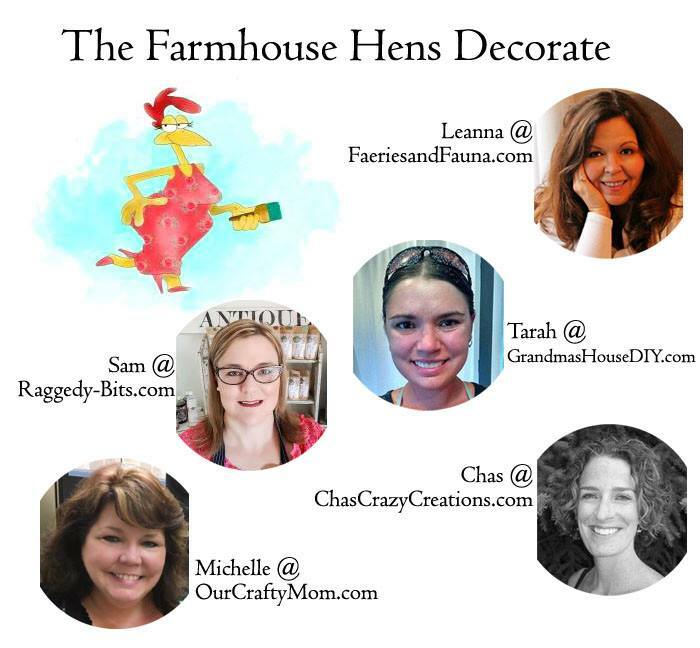 Make sure to check out the other fabulous Farmhouse Hens at the bottom of this post. I always enjoy our monthly Farmhouse Hen collaboration. I know there will be something you love. When making over something large like a table and chairs or a dresser, I tend to stick to neutral colours, so on a small inexpensive makeover, I love the idea of going bright fun and feminine. I knew the second I saw the lamp I was going to do a Kate Spade inspired makeover. Spray paint in gold, glossy white and black. Start by making a pattern of the lantern fabric. It’s easier and much less expensive to adjust paper first as a pattern instead of working directly with the fabric. Lay out a piece of paper large enough to easily go around the lampshade. I used parchment paper, but it would have been worth using some Christmas wrapping paper. If you use parchment paper it’s harder to adhere the tape to, but it does work. Find the seam at the back of your lampshade. Lay the shade down on the paper making sure that the paper is large enough to go around the lampshade. Wrap the paper over top of the seam and tape the edge to the lampshade. Using a pencil mark along the seam of the existing lampshade. This will be the first edge of your pattern. Continue tightly wrapping the paper around the lampshade. Do this until the other edge of your paper reaches the back seam. Again trace out a line along the edge of the seam, you should be able to feel it, and it doesn’t need to be perfection. Concentrate on the bottom end first, wrap the paper inside the lampshade. Using a pencil shade along the bottom edge. Once complete repeat the same process on the top of the lampshade. Remove the paper from the lamp and lay flat. Cut the paper out a couple of inches on the outside of the outline, this will be your pattern. Lay your fabric good side down, top with the DIY pattern, and pin in place. Using your DIY pattern cut out your fabric along the cut edge of the pattern, not the pencil marks. The back seam will be the most noticeable part of the project. I knew I want this part of the lampshade to be as nice as possible. The final edge of the seam needs to be folded under and as straight as possible. Fold the edge where the seam will be over along the line. Then iron it to form a crease. Remove your pattern, and pin the straight ironed edge to ensure it stays in place. Place the creased edge along the seam on the lampshade. Using pins punch the edge to hold it in place. Roll the fabric around the lampshade to confirm where the other end of the fabric needs to be. Pin the uncreased edge in place, and unpin the other creased edge. Unroll the fabric from the lampshade and spray with the adhesive. Starting in the middle press the fabric in place, making sure there are no wrinkles. If wrinkles occur, just pull up the fabric and reattach it. Once you get the fabric smoothed out to the top and bottom edges, repeat the process. Unroll some of the fabric, spray with adhesive, smooth to the ends and repeat until you are five inches from the creased edge. Next glue the uncreased edge completely, finally line up the creased edge to match the lampshade seam, spray with adhesive and glue. If your fabric is longer than an inch, trim it. If your lampshade top has cross brackets just make little snips in the fabric to accommodate it. Working a little bit at a time roll over a piece of your fabric 1/4 inch, and keep rolling until its next to the top of the lampshade. Once its next to the top edge, place a thread of glue along the top of the lampshade and glue in place. Repeat the process all around the edge. Do the same thing on the other edge. 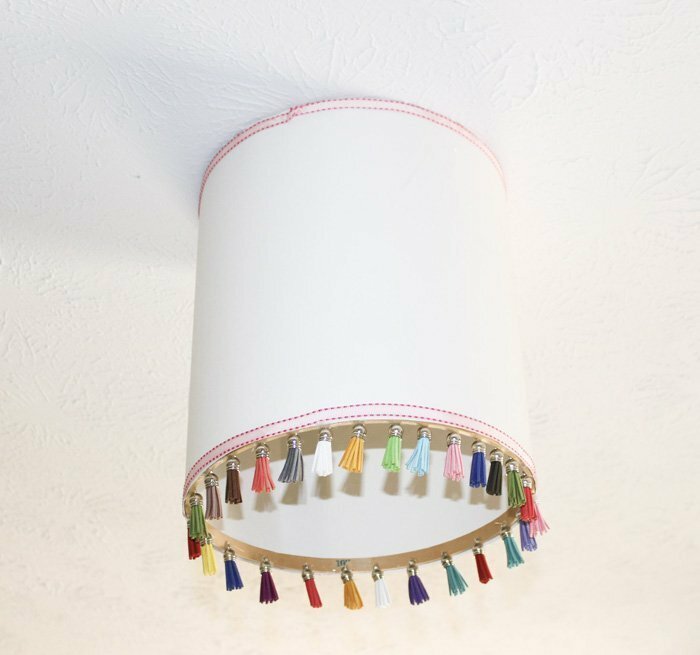 My first plan was to use blanket edging to edge the top and bottom of the covered lampshade, but I loved it as it was. Instead, I glued the edges of the blanket edging together and made a fabric bow out of it. I think the bow is cute, but know I may tire of it, so instead of gluing it in place I just pinned it into place so it’s easily removable. The base of the lamp was painted with gold, black, and bright pink spray paint. I just recently cleaned and organized our paint stash so I knew I had those three colours and would not have to buy anything. It could easily be just sprayed gold or event silver depending on the paint you have on hand. Start by taping off the areas not being painted gold, including the plugin. Spray paint it with at least two light coats of gold and let dry. Remove the tape. To paint the little dots on the lamp I took an extra precaution. As the gold paint is so fresh instead of taping directly on it, I suggest covering it with a bit of plastic and then taping it snuggly. I then covered the entire lamp beneath the wall areas with a rag and taped that together. Each ball was painted in its perspective colour with two coats. If you only knew how perfect this lamp would look in my office! LOL I even have a black and white polka dot chair to go with it 🙂 Love what you did with it – excellent tutorial too! From blah to fun! Very cute makeover. I’ve tried to makeover a couple of lampshades, it was tricky work! Great tutorial. I’m a visual learner and your pics are super helpful. Thank you very much for the feedback. Detailed tutorials don’t mean all pretty pictures, so it’s nice to know extra photos are helpful. I agree with Michelle, I’m feeling Audrey Hepburn but either way I love it. I have my eye out for one of those tall skinny lamps for my dining room. Now I’m going to the thrift store to look and just make that thing over. I love this challenge! I will keep an eye out on Intelligent Domestications looking for the makeover. I really love all the other Hens posts as well, such unique ideas. Oh how I love polka dots!!! And boy do they look so cute on your thrifted lamp! 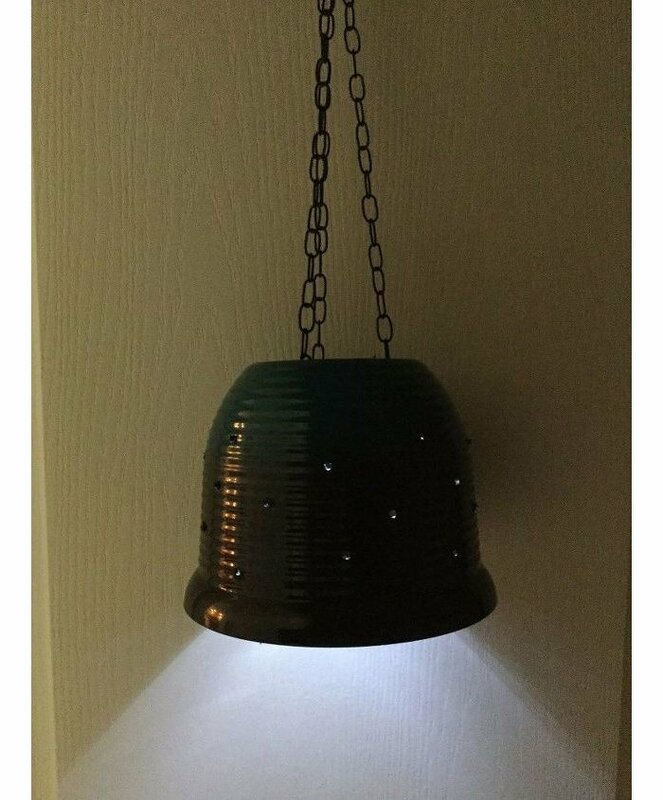 Love the unique design of the lamp to!! Perfect makeover! Thrift stores here have boutique prices except for two which of course are popular. One is hidden, small and very closeby. I found this lamp there for $8.00 they only had 2 lamps lol. I couldn’t grab it fast enough for our makeover. Leanna, I just love your Kate Spade inspired lamp and agree with you that the shape is so cool! For some reason, I think it has an Aundrey Hepburn look too-very classy and elegant. Great update! This came out so sweet. I love how the polka dot material glams up the shade. Thank you Michelle. I knew exactly what I had in mind, and was super excited to find the exact fabric I wanted. Thank you Chas, I saw the little dots on the stand and knew instantly what I wanted to do with the lampshade.